About Us | St. Joseph Catholic Church, Wauwatosa, Wis.
St. Joseph Church is a vibrant parish of Roman Catholics in Wauwatosa, Brookfield, Elm Grove and western Milwaukee. Our life is centered around the Mass and supported by a wide variety of ministries, devotions and activities serving families, single people, children, young adults and senior citizens. We strive to be a place were people encounter Christ, are transformed by Christ and accept Christ's commission to spread the Gospel. As baptized Christians, we are evangelical and share Christ with others. As Roman Catholics, we are apostolic in carrying on and sharing the Gospel message entrusted to the Apostles and his Church by Jesus Christ. We are part of the Roman Catholic Archdiocese of Milwaukee, and carry on the legacy of one of the oldest parishes in the archdiocese. We are blessed with strong participation, excellent preaching and outstanding singing in our Masses. Our current pastoral administrator, Fr. Dennis Wieland, is supported in liturgies by Deacon Jose Gonzales and Fr. Steve Malkiewicz, a Franciscan priest. Approximately 1,100 households are registered with the parish, and more than 170 students attend our day school in grades K3 through 8. Hundreds more children, young people and adults learn more about their Catholic faith through our Catholic Formation program. Our congregation has been in Wauwatosa since the 1960s, but our parish was started in 1855, serving Milwaukee's rapidly growing German Catholic population of that era. We moved from that location at 11th and Cherry in Milwaukee when that land was acquired by Milwaukee County for construction of Interstate 43. (As you drive north on I-43 downtown, when you see the Leinenkugel's Brewery on the right, you are passing over the site of the original St. Joseph.) The bells in our bell tower are from the Cherry Street church, as are several other items, including the ornate baptistry seen in the current church narthex. The original relics in Old St. Joseph's, which are now in a reliquary in Fr. Dennis's office, were those of St. Peregrine of Auxerre (martyr) and St. Odilia (virgin and martyr). Both likely met their deaths during the persecution of Diocletian (ca. 303). The relics in the altar in the new church are those of St. Theophila (from Nicomedia, in present-day Turkey) and St. Engratia (from present-day Spain). Both were also martyrs, and like the parish's original relics, both of these "new" saints also died during Diocletian's persecution. We welcome you to join us! We are "Faith on Center." "We the people of St. Joseph are a Catholic Faith Community formed by the Gospel of Jesus Christ. Modeling the example of Jesus in the spirit of St. Joseph, we serve God, our community and each other by sharing our gifts of time, talent, and treasure. We strive to grow closer to God and foster the Spirit of God in each other, in the community and the world." 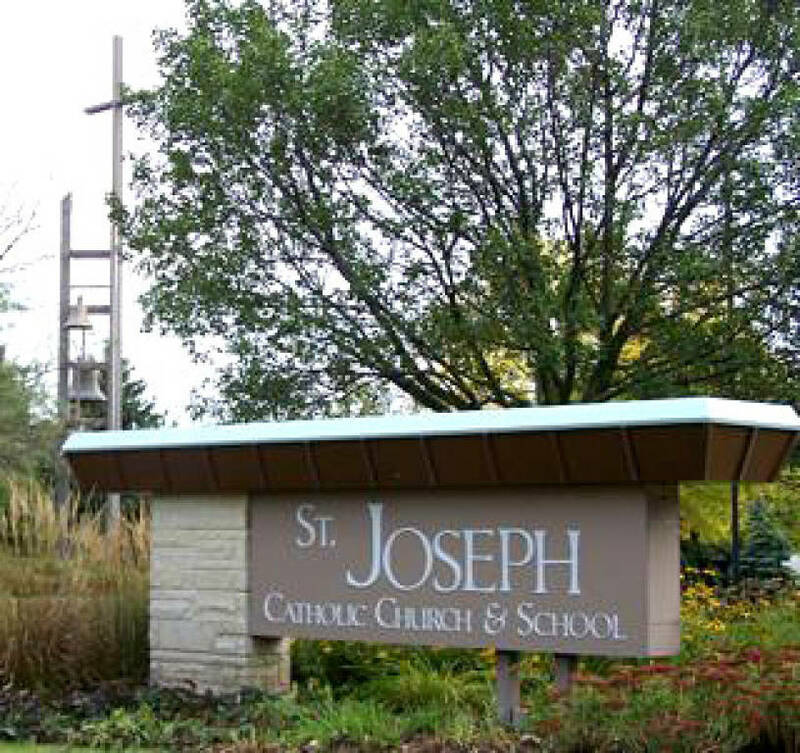 "St. Joseph Parish is a community where faith is enriched and nurtured. The Eucharist and Liturgy are both celebrations and sources of life. Active participation is not only meaningful but also energizing. We welcome all people and encourage them to share time, talent and treasure through stewardship.